The Carolinas were among the early states to try and launch railroads. North Carolina especially needed such transportation. But political differences between Eastern and Western portions of the state, as well as between Whig and Democratic political parties, inhibited implementation. In 1827, President Joseph Caldwell of the State College (now UNC) wrote and published newspaper articles promoting railroads over canals and turnpikes (plank roads). At this stage in business development, individuals wanting to set up corporations had to win legislative approval for their company. While the state legislature would authorize the creation of many railroads, most would never raise the capital or ever begin operations. There were two experimental railroads with cars drawn by horses. The first railroad company to operate in North Carolina was the Petersburg (Va.) Railroad, which by 1833 had completed its line, which included nine miles of North Carolina track near Halifax. By December 1837, the bridges over the Roanoke River had been completed. The first North Carolina railroad was Wilmington & Raleigh Railroad (renamed the Wilmington & Weldon Railroad in 1854). Chartered in 1834 to build a railroad from Wilmington to Raleigh, the company won financial backing from Wilmington residents, but not from Raleigh business interests. So the Wilmington stockholders petitioned the legislature in 1836 to change the route to run from Wilmington to Weldon in Halifax County  at 161 miles it would become the world's longest railroad when opened. It would connect with the Richmond and Petersburg Railroad which had pushed its line nine miles into North Carolina. The change was approved. Construction began on October 25, 1836. 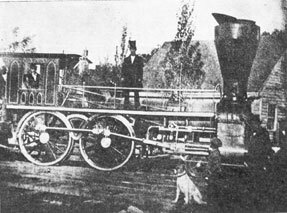 At the same time, Raleigh businessmen won approval to create the Raleigh & Gaston Railroad on December 21, 1835. This 86-mile railroad also would connect near Weldon with the Richmond and Petersburg Railroad. Construction began in 1836. The Wilmington & Raleigh Railroad completed its full route on March 9, 1840. The Raleigh & Gaston Railroad opened its full route in April 1840. Both railroads had to receive state financial support in the early 1840s to supplement their private funding. The Wilmington & Raleigh Railroad would reach profitable operations in 1850, while the Raleigh & Gaston Railroad would be foreclosed in 1845 by the state, which continued to operate the line. The Wilmington & Raleigh railroad was reorganized in late 1851 with state and private ownership, and from 1854 it began paying dividends and was renamed the Wilmington & Weldon. 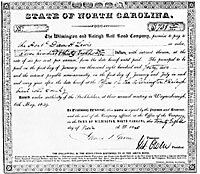 The state legislature in 1849 approved the creation of the North Carolina Railroad when Senate Speaker Calvin Graves ended his future political career by breaking a tie-vote for passage. The new railroad company would be headed by former Governor John M. Morehead while being constructed. The line would run from Goldsboro through Raleigh and Salisbury to Charlotte. It would connect with the South Carolina rail system at Charlotte, opening transportation to the port of Charleston. The North Carolina Railroad also would connect with the Wilmington & Raleigh line and thus, to the Virginia railroads. This 223-mile route was opened on January 29, 1856. Western Railroad Company  chartered in (1852) for the purpose of connecting Fayetteville with the coal regions of Chatham (now Moore) County, North Carolina. C. B. Mallett was the second president (1855 - 1868). This line consolidated with the Mt. Airy Railroad Company in 1879 to form the Cape Fear and Yadkin Valley Railway Company. Atlantic & North Carolina Railroad  chartered in 1854; opened June 17, 1858; 95 miles from Goldsboro to New Bern. Western North Carolina Railroad  opened fall 1858 with 84-mile line from Salisbury to within four miles of Morganton. Wilmington, Charlotte & Rutherfordton Railroad  110 miles from Wilmington to Rockingham, and then from Charlotte to the Wateree (Catawba) River. Wilmington & Manchester Railroad  161.5 miles from Wilmington to Manchester (SC). The railroads quickly supplanted plank roads. Fayetteville had championed plank roads with its three major turnpikes built after 1848. There were two experimental railroads built using horse-drawn carts over rails. These were constructed at Fayetteville (2 miles) and at Raleigh (1.25 miles), which was used to carry quarried stone to the new state capital being built. Romulus Saunders, with Rufus H.
center, RGRR Treasurer Major W.
Rufe Smith, in the foreground.